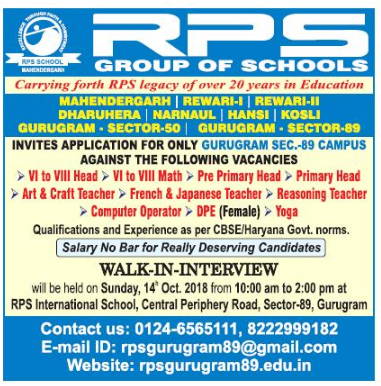 RPS Group of Schools, Gurugram has advertised in THE HINDUSTAN TIMES newspaper for recruitment of Teachers jobs vacancies. Interested and eligible job aspirants are requested to walk-in on 14th October 2018. Check out further more details below. About School: Rao Pahlad Singh (RPS) International School, Gurugram is a school that is founded on the vision of spreading value base education to every corner of INDIA. With the chequered history of 20 years of landmark contribution in the field of education ,RPS has become the most significant link in the chain of education started by Dr. O.P Yadav, a well known Advocate and educationist , who committed passionately to the cause of quality education .This vision takes shape under the dynamism of its Chairperson Dr. Pavitra Rao. RPS has consistently bagged the envious position in the topmost Haryana Schools ,speaking volumes of its excellence in multifarious disciplines. RPS has been rooting records of its achievements for the last 20 years since it was established.